Over sixty years later, and the divisions still run deeper than the straits which separate the Republic of China from the People's Republic of China. Once again, a historically, ethnically, and culturally homogeneous people separated by politics and economics hurl men, weapons, and material into the maelstrom of modern combat in an attempt to settle their bitter division once and for all. 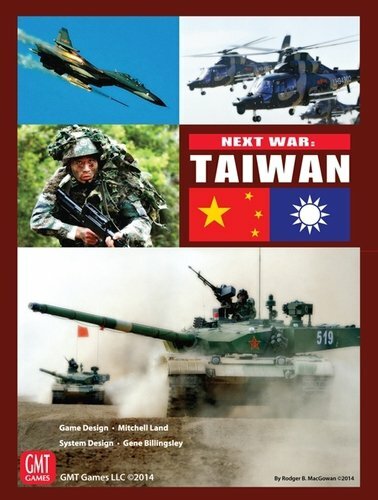 Next War: Taiwan, the next volume in GMT's series of Next War games and the follow-on to Next War: Korea, allows players to fight a near future war in and around the island of Taiwan. In this sequel, the communist state of China, the PRC, has decided that it’s time to end the rhetoric and posturing and bring the breakaway republic back into the Socialist Harmonious Society. Due to the nature of the "terrain" surrounding Taiwan, the game features an expanded, yet still abstracted and playable, naval system including submarine threats, ASW, mine warfare, and anti-naval strikes. In addition, rules exist for combining Next War: Taiwan with Next War: Korea to simulate an expanded conflict. Note: the Next War series is not an Introductory wargame. Rather, we have intended herein to create a system (and a series) that will allow detailed study of modern warfare in various venues as well as engaging gameplay. That said, the Standard Game rules encompass a fairly straightforward rule set that will, we think, be considered pretty "easy to learn" by experienced wargamers. So players who choose to play Standard Game scenarios can have a relatively quick game when that's what suits them. The real flavor of a war in the theatre, though, comes through in the Advanced Game, where you get much more control over airpower and can more clearly see each side's strengths and weaknesses. For players who want a "mini-monster game" experience, playing the Advanced Game Campaign Scenarios with some or all of the optional rules will definitely "deliver." Ground units in Next War: Taiwan represent primarily brigades, regiments, and battalions of the armies of the two Chinas and the United States. 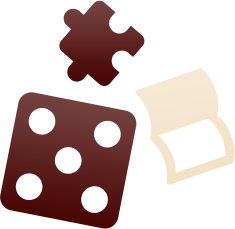 All ground units are rated for their attack and defense strengths, movement capabilities, and unit efficiency. Air units represent fighter, bomber, and attack squadrons of the major combatants and are rated for All-Weather Capabilities as well as their range, average pilot skill, and their abilities in Air-to-Air Combat, Close Air Support, and Strike missions. 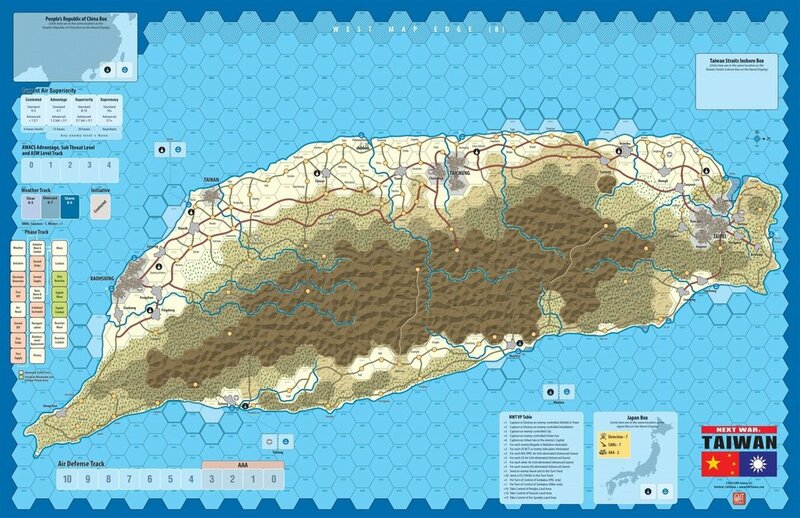 The game's map presents the island of modern-day Taiwan at a scale of roughly 7.5 miles per hex. The map covers the entire island and includes several holding boxes and tracking displays. The game system is almost identical to the one in Next War: Korea, although we have added a few things here and there. Weather Determination. Bad weather can severely hamper air and naval operations activity and can significantly slow ground operations. Initiative Determination and Air/Naval Phase, wherein Air Superiority levels and air availability are determined and Sea Control is established or modified. Special Operations Phases in the Advanced Game allowing players to utilize their special operators in various recon and raid missions behind enemy lines. Strike Phases in the Advanced Game allowing players to launch air strikes, cruise missiles, and artillery and SSM strikes. Combat resolution examines not only unit strengths but also unit efficiency (representing training, doctrine, and morale), as well as the terrain where the combat takes place. The CRT tends to be very bloody in nature, reflecting what we believe will be a degree of attritional warfare early due to the lethality of modern weapons. As in many games, casualties represent not only actual combat losses but also losses of unit cohesion brought about by the rapid pace with which modern armies are able to engage and exploit on the battlefield. There are several Standard Game scenarios. The first three are small and cover the first weeks of the war by dividing the island into roughly three equal sections. These focus on the initial assaults by the PRC to establish beachheads and take Ports and introduce players to the basic mechanics of the system, while giving them insight into attack and defense strategies for the "big game." Players can also play the entire Campaign Game which uses the entire map and all of the Standard Game rules. One other scenario is provided which examines a theoretical U.S. Amphibious landing in an attempt to take back the island. 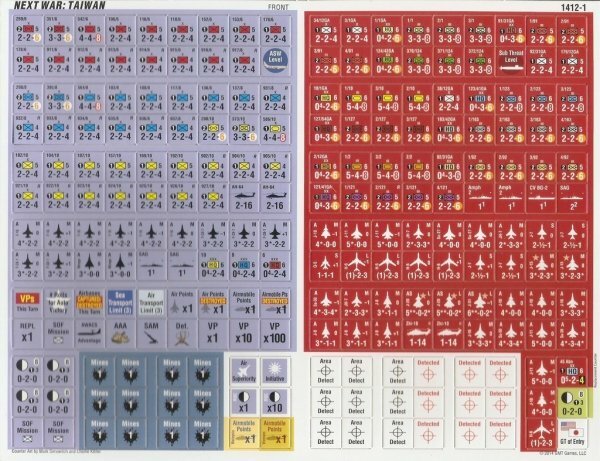 The Advanced Game Scenarios come in three flavors à la NATO: The Next War in Europe: Strategic Surprise, Tactical Surprise, and Extended Buildup. This offers the players the ability to game out a variety of "At Start" war scenarios based on varying levels of readiness. There is also an International Posture Matrix à la Flashpoint: Golan to allow players to experiment with a variety of intervention options for the non-Chinese players in the region. 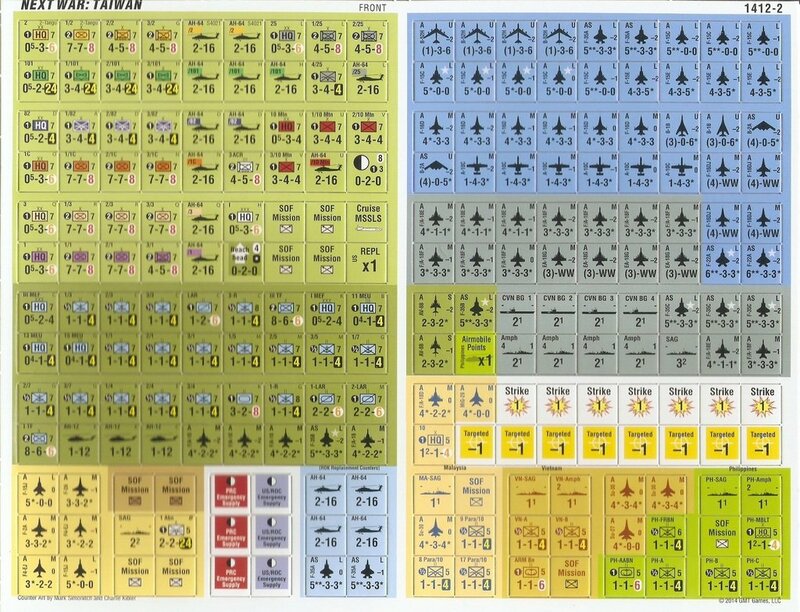 In addition, there is a full set of rules covering how to play a combined Next War: Taiwan/Korea game.